Men need dressing rooms, too, right? We wanted to create a space that felt deliberately masculine, yet chic. The reoccurring finish is the gorgeous brass / bronze throughout. It is used for the oversized pulls, custom shagreen island and insetted into the wardrobe doors. These are covered in a stunning, embossed, weaved leather adding dimension, texture and so much interest. To showcase a gentleman's shoe collection, while making it a feature to the design itself, it was necessary to fit the shoe display with subtly tinted glass. 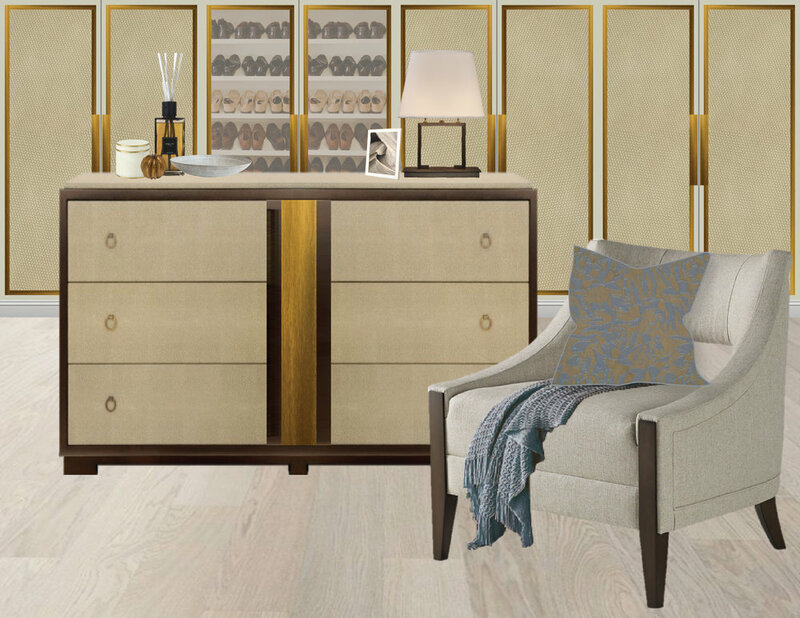 This dressing room's neutral base makes it ideal for both men and women, but we were sure to add a pop of color through a dusty blue-gray and bronze pillow paired with a cozy throw.